Traditional 4 bed detached villa situated in the exclusive Manastir area. Beautiful sea and Bodrum Castle views. Private pool, close to beach and town. This 3 storey villa offers everything a visitor could want – privacy, stunning views and only 10 minutes walk into the hustle and bustle of town. Bodrum castle is a spectacular sight lighting up the evening sky. 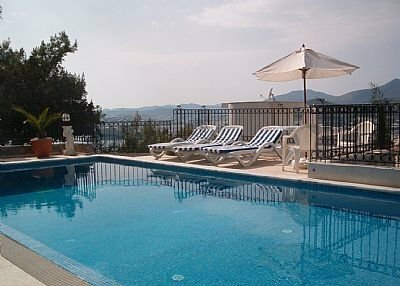 For peace and tranquillity return to the villa for a refreshing dip in the private pool (7.5m x 3.5m) or head for the beaches just 10 minutes away. Local buses (Dolmus) pass by frequently and there is a taxi rank close by at the Manastir Hotel. Enjoy the traditional Turkish lounging area, 2 balconies or the roof terrace for drinks and meals. The villa has air conditioning, although this is rarely needed. With the cool sea breeze reaching up from the bay – this is a wonderful holiday home! Undoubtably the best area to stay in Bodrum: close proximity to the town and yet tucked away on the hillside for relaxing moments. Bodrum is a shoppers paradise: a vibrant town centre offers cafes, fish restaurants and tiny shops selling leather, jewellery and beachware. Looking for Turkish culture - head for the local bazaar or browse for souvenirs in the narrow streets. The lively port and yacht marina is a busy hub with fishing boats bobbing amongst the locally built wooden gulets of all sizes, some offering state of the art facilities. This picture-postcard resort is often referred to as the St Tropez of the eastern Aegean. It has a cosmopolitan atmosphere and a lively night-life. The focal point of Bodrum is the magnificent 15th-century castle of St Peter with the Mausoleum resting close by – known as one of the seven wonders of the world! Scuba diving in the turquoise waters is on offer for adventurous souls or take time out at the Turkish baths opposite the bus terminal. All this on offer and Villa Leila nestles right above, within the layers of dazzling cube-shaped, white-washed houses rising up from the harbour. There is a daily ferry service to Kos, with tickets easily booked along the harbour front. For your convenience, we will include a complimentary welcome pack on arrival. Villa Leila welcomes children and babies. Cot available . The villa has been renovated and furnished to a high standard to cater for all your needs. Layout of bedrooms: 2 doubles, 1 single, 1 twin bed and in the lounge is an ottoman and sofa bed.